The property market in Malaysia is on an upward trend with middle class suburban property prices rising driven by the steady stock market movement. Ho Chin Soon, director of Ho Chin Soon Research, a property company that specialises in land use and ownership maps, said the KLCI which has been moving upwards from 2009 to 2010, will be a catalyst for the property market. "However, the high-end and high-rise property market is still in a cautious mode with property developed by branded developers expected to do well," he said during a talk on "2010 Asian Equity and Property Outlook" on Saturday. "Sentiment will be much better this year onwards, provided the economy holds up," he said. Ho said demand for high rise properties in Kuala Lumpur was expected to continue due to limited land space. "High rise residential units in KL generally grew some 12 to 18 per cent per annum for the past 15-20 years. Whatever small growth that KL has is channeled into high rise projects," he said. Another prime property location was also in Mont Kiara in Kuala Lumpur where development has become more commercial, he said. Elsewhere in the region, Ho said the property markets in Singapore and Hong Kong were doing exceptionally well with property prices shooting up. Ho said Malaysia was relatively sheltered from the global financial crisis (compared to the Asian financial crisis) and there was still an upside potential in property investment in Malaysia. Another speaker, Joanne Goh, senior equity strategist and vice president of group research in DBS Bank, said sustainable growth was expected this year with Asian economies projecting a six per cent growth while the G3 countries were forecast to grow at two per cent this year. The "continuation of the governments' stimulus programme in Asia this year will benefit economic growth in the various countries concerned," she said during the seminar. "Stock markets in Asia, excluding Japan, are fairly valued with a minimum 15 per cent upside on earnings growth," she said. However, Goh warned that there will be economic risk concerns this year. "There is still economic growth concerns this year such as the effect of the expected rising interest rates and developments in the United States such as the unemployment rate," Goh said. She said while there were concerns that interest rates could go up due to pressures from cost push inflation such as rising oil prices, materials and business costs, the numbers will not be scary. "The low interest rate enviromment will likely continue," she said. Another effect that could have an impact on stock markets was the impending World Cup this year whereby bourses were expected to be quiet before and after the event, she said. KUALA LUMPUR: Naza Group, Malaysia’s biggest luxury vehicle importer, has lined up RM6.4bil of property projects this year and is in talks for its first overseas real estate foray in China. The company, picked by Peugeot Automobiles this month to lead its expansion in South-East Asia, aims to more than double its property unit’s revenue to RM2bil in five years. It had longer term plans for a property trust and was drawing investors for a proposed 100-floor tower in Kuala Lumpur, joint chief executive officer S.M. Nasarudin S.M. Nasimuddin said in an interview. Loans approved for Malaysian home purchases rose to RM7.3bil in November, the highest level recorded in 2009, adding to signs the country’s economy is rebounding, central bank data show. Bank Negara meets on Tuesday to decide whether to maintain interest rates at a record low, as investors speculate China may tighten monetary policy to curb asset-price inflation. “Since the second and third quarter last year, activity and prices have picked up, except for the high-end market which is not too exciting,” said Goh Tian Sui, managing director of C.H. Williams Talhar & Wong Sdn Bhd, a property consulting company, in a telephone interview. Nasarudin and his brothers Faisal and Faliq are sons of the late Nasimuddin Amin, the group’s founder. Nasimuddin began selling luxury cars in Malaysia when he was 21 and built Naza into one of the nation’s biggest auto groups after securing the rights to assemble Kia Motors Corp vehicles in Malaysia. He died of cancer in May 2008 at 53. Naza, which Nasimuddin founded in 1974, expanded into transport, property, hotel and the food and beverage industry. Its real estate business today accounts for 30% of group sales, its second-biggest contributor. “The benchmark for the family is that we want to be like the Tata Group, the Jardine Group, that will last generation after generation,” Nasarudin said. Among its seven projects planned for this year is the RM4bil Platinum Park at the Kuala Lumpur City Centre, comprising three office towers, three residential towers and a hotel. Naza, which sells Ferrari and Maserati cars and Ducati motorbikes, was also lining up foreign investors for Kuala Lumpur’s biggest property project, Nasarudin said. It won land rights in November from the Government to construct an exhibition centre, on top of which it may build a 100-floor tower as part of a RM15bil, 15-year project. That’s potentially higher than Kuala Lumpur’s 88-floor Petronas Twin Towers, previously the world’s tallest building. A master plan would be ready next month, Nasarudin said. A real estate investment trust was also “something we will look at eventually, after five years,” Nasarudin said. That’s when Naza TTDI Sdn Bhd, its property unit, may rank among the top three developers in Malaysia, he said. Plans to rejuvenate MK Land Holdings Bhd have hit a snag as three of its four chief operating officers (COOs) who were roped in to turn around the property development company are leaving. It is understood that there is a dispute over management of the company, controlled by tycoon Tan Sri Mustapha Kamal Abu Bakar. The three senior executives are R. Balasundram, Fatimah Wahab and Yusof Abu Othman, who together with Lau Shu Chuan were appointed as COOs in November 2008. According to a source close to the company, Mustapha Kamal had recently appointed his eldest daughter as the company's executive director. However, he had also promised to promote others to higher positions. The source said Fatimah will tender her resignation soon to move on to other prospects. Balasundram may still be involved in Emkay Group, which is Mustapha Kamal's privately-held outfit. When contacted by Business Times, Fatimah confirmed that she is leaving MK Land by March, but declined to elaborate on her plans. Yusof did not return calls for comment. Mustapha Kamal was also not available for comment. The list of names bandied around to replace the departing three include Peter Teh Heng Poh, Mazrita Mazlan and Jaya Sangaran. Peter is currently Emkay COO while Mazrita and Jaya are the senior general managers. MK Land had posted losses in 2007, the first time since its inception more than 10 years ago due to additional costs incurred to complete projects. This happened after Mustapha stepped down as executive chairman in April 2007 to focus on his private companies. He returned to helm MK Land in June 2008 in the hope of turning the company around by outlining a three-year plan to rejuvenate it. This was when the four COOs, who were roped in from Emkay and Setia Haruman, were appointed. Since then, MK Land has been able to make profits as it cut costs and boosted sales. It posted a net profit of RM18.3 million in 2008 versus a net loss of RM61 million in 2007. The source said MK Land may be in the red in the current financial year ending June 30 2010 unless it could strike a mega en-bloc sale soon. For the first quarter ended September 30 2009, MK Land posted a net profit of RM1.2 million. Under the leadership of the four COOs, MK Land was recording average sales of RM30 million per month, three times more than prior to their appointment. "With the key people leaving, there is a possibility it will impact the company's performance," the source said. UEM Land Bhd aims to be Khazanah Nasional Bhd what CapitaLand is to Temasek. “We aspire to be a global property development outfit like CapitaLand. We hope to one day play a similar role in Khazanah – be what CapitaLand is to Temasek,” says managing director and CEO Wan Abdullah Wan Ibrahim. Singapore-based CapitaLand Ltd is Southeast Asia’s largest property company in terms of market capitalisation, with sprawling assets and interest throughout the region. UEM Land, more than 70% owned by UEM Holdings Bhd, is the flagship property developer of the UEM group. The group, in turn, is part of Khazanah’s vast stable of companies in more than 10 sectors. Says Wan Abdullah: “Our strategy is one of a fast-growing property developer with a large landbank for future development. We recognise that we are a relatively small player compared to the highly diversified property player like CapitaLand. “However, by focusing on our role in making the Iskandar Malaysia (IM) region a success, and diversifying to other major cities in Malaysia to build new profit centres and develop new income streams, we are taking the necessary steps in the right direction. “At the same time, we continue to build capacity and capability, so things could only grow from here,” he says. The company plans to use that vast piece of land to prove its mettle. It is the master developer of Nusajaya, located west of Johor Baru. With the land covering almost 24,000 acres, UEM Land is building a new city on a greenfield site. The plan is to develop it via eight catalytic developments. “I am building a city with all the infrastructure that come with it and more. In addition, we are positioning Nusajaya as a city of considerable standing. I therefore need a diverse range of products. “Any developer will tell you to conserve cash, start from ground zero and build organically. I don’t have that luxury. Our strategy is concurrent development by working in collaboration or partnership with other reputable developers to catalyse Nusajaya’s development. Admittedly, there are projects that have a longer gestation period,” says Wan Abdullah. Today, the company have medium-end housing (Nusa Idaman), high-end (Horizon Hills) and super high-end in East Ledang. It also has a waterfront project – Nusajaya’s Puteri Harbour. Wan Abdullah says the fact that the company won the Master Plan category in the Fiabci Malaysia Property Awards 2009 for Puteri Harbour means that it is moving in the right direction. UEM Land recently announced plans for a RM970mil rights issue that will give them a mixture of debt and equity funds to finance its development plans for the next four years. Besides Nusajaya, the company also has interests in Cyberjaya. There is also talk that it may get some of the Government’s landbanks around the Klang Valley. “We believe that we will be in a good position to be considered to develop government land around the Klang Valley if and when the Government decides to dispose of them or open up such land for development,” he says. On the pullout of Dubai’s Damac Properties from Nusajaya, Wan Abdullah says there are several interested parties and they are in advanced stages of negotiations for several land plots in Puteri Harbour, including those which were supposed to be sold to Damac. Besides waiting for suitable investors to come along, the company will do as much as it possibly can. “We cannot do it alone, we need partners who can lend their skills, expertise and ideas to Nusajaya. But we only want partners who have deep pockets and who can add value to what we are doing,” he says. CHENNAI: Indians spent almost RM500 million over the last seven years purchasing properties in Malaysia, making them the fourth biggest property buyers in Malaysia. International Trade and Industry Minister Datuk Mustapa Mohamed said after Singapore, United Kingdom and South Korea, cash-rich Indians have emerged as major investors in Malaysia's property sector. "India is now the fourth highest buyer of properties, they have a growing strong middle-class with good purchasing power. 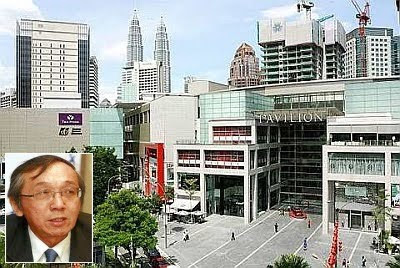 "And, the close connectivity to Malaysia from India, and also the commonalities between both countries are some of the reasons why more Indians are coming to Malaysia to buy properties," Mustapa told reporters at the Malaysia Property Expo 2010, which opened in Chennai on Saturday. The landmark ruling by the Federal Court on Thursday, which held that land transferred by fraudulent means will no longer be legally accepted, is a huge triumph to the champions of “the rule of law” and will hopefully stop the problem of illegal land transfers in the country. With Malaysia pushing for high economic growth and greater inflow of foreign direct investments, there is too much at stake to allow such blatant disregard for one’s property ownership rights. It is certainly the right step towards ensuring greater transparency and good governance to create greater confidence among the people and potential investors. The unanimous ruling by the five-man bench led by Chief Justice Zaki Azmi sitting on the case of Tan Yin Hong vs Tan Sian San and two others, has plugged a loophole in the law that will allow landowners who lost their land through fraudulent means to redeem their right to the property. The judgement has paved the way for the apex court to depart from its controversial decision delivered on Dec 22, 2000, in the case of Adorna Properties Sdn Bhd vs Boonsom Boonyanit. In the Adorna case, the three-man panel led by then Chief Justice Tun Eusoff Chin which ruled that a person who had obtained a title, whether fraudulently or not, had a legal claim to the property. Thai national Boonyanit lost her land in Penang after an impostor, who claimed to be her, obtained a replacement title from the land office. The land was subsequently sold to Adorna Properties which managed to seek a Federal Court decision to overturn an earlier decision by the Court of Appeal to return the land to Boonyanit. That judgement meant the law could not protect landowners (even if they can prove the land title is theirs) as long as it can be proven that the purchaser bought the land on good faith. This resulted in land fraud victims being unable to recover their property. As one lawyer notes, since the 2000 judgement fraudulent land transfer has become a thriving business and those who are particularly susceptible to such frauds comprise mainly elderly people or illiterates whose land have been left idle for many years. With Thursday’s ruling, it means that if it can be proven that a title has been obtained by forgery or misrepresentation, then the claim can be defeated. This will help curb forgery incidents and land scams and protect land owners from being cheated of their property. It should bring much relief to land owners as there is now a legal recourse for them to reclaim properties that have been fraudently transferred and to seek due compensation. As the lawyer points out, there are actually two victims – the original purchaser and the subsequent bona fide purchaser who ends up with the land. The onus is on the land authorities to be extra vigilant when they register transfers of land. Purchasers must also be careful and do a thorough search of the land title before signing any deal. Deputy news editor Angie Ng believes Malaysia has much to benefit from putting its house in order, starting with righting the wrongs that are still around. SRI PETALING: Financially distressed Ho Hup Construction Co Bhd has proposed to revamp its “initial regularisation plan” following fierce opposition from a group of shareholders led by its former managing director. “The revised plan was designed to address two issues: the need to get Ho Hup out of the PN17 status and to allow all substantial shareholders the opportunity to remain as substantial shareholders in Ho Hup post-restructuring,’’ managing director Lim Ching Choy told StarBizWeek in an interview yesterday. Yesterday, Ho Hup announced that it had applied to the exchange for a three-month extension from Feb 4 to submit a revised regularisation plan. The latest development came amid heightened tension between Ho Hup’s top two biggest shareholders. Ho Hup’s second-biggest shareholder and former managing director, Datuk Low Tuck Choy, had called for an EGM on Feb 4 in a bid to replace the majority of the group’s existing board with six new appointees. One of his main grouses against the current board led by deputy executive chairman Datuk Vincent Lye was over the company’s original regularisation plan that was submitted on Oct 30 last year. Low had even came out with his own plan to revive the ailing builder, although he said in a recent interview that he was not going to be involved in active management of the company his father had founded. The revised scheme calls for shareholders to take a 60% capital reduction from the par value of every share held, which was significantly lower than the original plan for 95% cut. Ho Hup’s current paid-up capital stands at RM102mil. Also more rights shares, up to 30 million units to be sold at RM1 each, would be made available to existing shareholders post capital reduction. This is against the 12.75 million rights shares offered under the old scheme. Only 10 million new RM1 shares are to be placed out to investors to unidentified investors, against a total of 26.25 million shares planned previously. Lim said the company needed to raise at least RM40mil in cash under the revised regularisation plan to have enough cashflow and jumpstart its property project at the 60-acre site in Bukit Jalil, Selangor. “If the rights shares are not fully subscribed for by the shareholders of the company, the balance of the shares not subscribed would be placed to investors,” he said. The revised plan also provides an option for shareholders to reject the capital reduction plan as a whole, but this would come at a price of losing a chunk of the group’s prime landbank in Bukit Jalil. “What we hope to do is to keep the landbank intact in the company and raise enough money to develop it,’’ Lim said. He estimated the gross development value of the land at RM1bil. Ho Hup declined 4 sen to close at RM1.19 yesterday on volume of 400,600 shares.